Japan’s late-Eighties Bubble Era produced some of the most extreme and extraordinary cars to ever see public roads. The triple-rotor Mazda Cosmo grand tourer and the gullwing Autozam AZ-1 city car spring to mind. But there were many others that didn’t quite make it, including the Group C-for-the-road Jiotto Caspita. 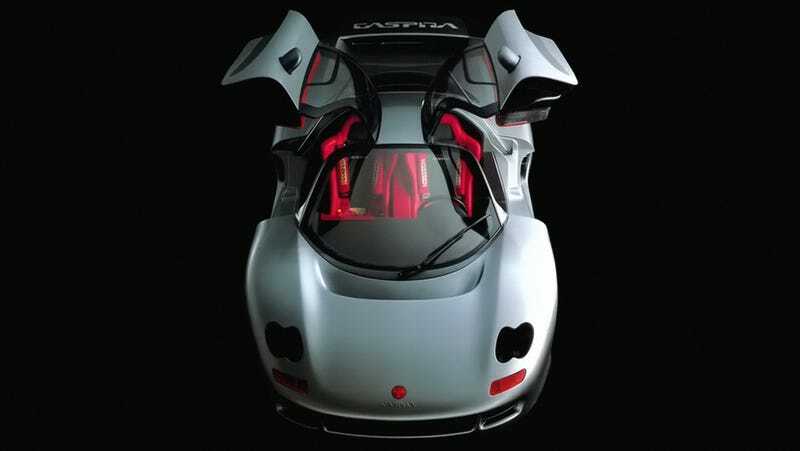 The Caspita was a product of Dome, the small racing company best known for building Toyota’s Le Mans cars at that time. Dome was building the car as a showcase for a new Japanese automotive design studio, Jiotto Design. In 1989, Jiotto and Dome showed off this sort of road-going version of their prototype racing designs at the blooming Tokyo Auto Show. The show also included a midengined Isuzu four-door with a fax machine, which hopefully gives you a sense of how generally nuts the period was. In any case, Dome’s Jiotto Caspita was going to get a 450 horsepower, 10,000 RPM flat-12 engine that Subaru briefly used to support an ill-fated F1 program. When it became clear that engine was a dud, Dome abandoned the engine. It was just in time for the global demand for supercars to fall out, along with the Japanese economy in general. The bubble burst, and the Jiotto Caspita never quite made it. Honestly, it could have been worse; Dome and Jiotto could have taken a ton of orders for the car and then been held to them despite it not making any financial sense for the company to make and sell such a high-priced car. That’s what happened to Porsche with the 959 and Jaguar with the XJ220. If you’re wondering what happened to that flat-12, it nearly became the heart of every Koenigsegg. Somehow, Dome didn’t entirely give up on the project and brought it back with a slight restyling in 1993. This time it had a 3.5 liter V10 from Judd, an engine supplier that built engines for both Le Mans and Formula One. Both sports car racing and F1 shared engine regulations around that time. Dome said the refreshed Jiotto Caspita apparently made a good 585 horsepower at 10,500 RPM and 276 lb-ft of torque at the same 10,500 RPM, according to an official leaftet with a claimed 3.4 second 0-60 time and a 214 mph top speed, as CarStyling.ru recalls. Weight was 1260 kilos, or just shy of 2,800 lbs, as noted by Automobiles-Japonaises. I’ve never been able to find that figure verified, though I did just come across this recently-reuploaded video showing the car’s promotional film where it ran Japan’s Yatabe high-speed test track. The video doesn’t show any exact figures, which is a bummer. Worse, the car never actually made it into the hands of any customers. I think the world deserved this kind of car, and it’s a shame it didn’t quite make it.